"Drive for show and putt for dough." Distance decides if you're putting for par or for birdie. 80% of the birdies are being played on the par fives. And with a slight tailwind some players out there can reach even a 650 yards hole with a driver and a long iron. 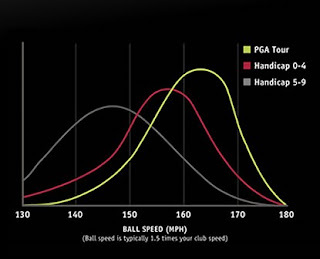 As a rule of thumb your maximum carry distance in yards is clubhead speed (mph) * 2.4. If you are shorter you should optimize technique and driver. The following picture from Titleist shows the correlation between distance and handicap.